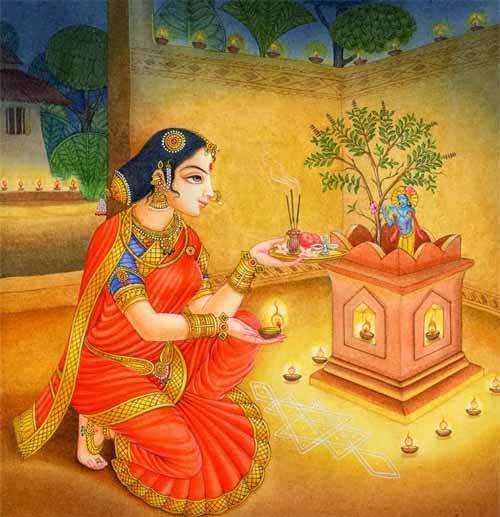 If you are facing problems in the marriage, then an ideal solution in Hinduism is to perform Tulsi and Vishnu puja. Here are few tips to solve marriage problems using Tulsi plant. Keep a Tulsi plant in your house. On the eas side of house. Offer lamp lit using cow ghee daily in the evening. Offer some Tulsi leaves to Lord Vishnu. Later keep the leaves hidden in the bedroom. Offer Sabudana kheer to Tulsi and later share it as Prasad with family members and neighbors. Worship Tulsi and Shaligram or picture of Vishnu daily. Perform the annual Tulsi Puja on Kartik Shukla Paksha Dwadasi (after Diwali). Read the Bhagavad Gita daily - make it a point to read and understand a few stanzas. Only pour water under the plant. As fertilizer only use cow dung and leaves. Do not use fertilizer brought from outside as it contains unnatural materials and bones.